Pairing the right food with the right wine need not be difficult, but to give you just a little help, check out some wine ideas here in Food Pairings. There really are no set rules when matching the right food to the right wine. That's mainly because there really is no "right" or "wrong" way to pair food and wine together. Sure, some wines lend themselves better to certain types of food than others and sure, certain wines may need center stage and are just best enjoyed on their own, but still, there are no strict rules. If you're thinking about the whole "red wine, red meat; white wine white meat" adage, forget you ever heard it. Big wines like Bordeaux, Amarone, Barolo or many Cabs don't like to share the spotlight…with anything. Many of these wines end up overpowering whatever it is you're eating, so before pairing a big wine for your next dinner party, try a little personal taste test before the party to get an idea of the flavors of the wine. When you drink the wine you love, you will rarely, if ever, go wrong. When in doubt, choose a simple, easy to drink wine. Pinot Noir goes with just about every type of meal from gourmet fare to barbeque. 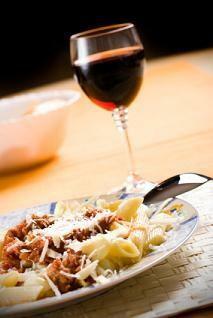 If the food is overly complicated, stick with a less complicated wine.